Step-by-step instructions for how to set up your City72 site. You will need technical support from a web developer (an internal City resource or a contractor) for these steps. You will need a web developer, or a person with technical expertise, to help with these steps. 1. Choose a short abbreviation for your city. For example: SJ72 for San Jose, or DEN72 for Denver. With the addition of a suffix such as .org or .gov, this will become the URL for your new site. 3. Point the domain to your server. Each domain registrar is different so you will need to locate where to enter the domain name servers (DNS information) that you get from your hosting provider. Suggestion: Wait until your site is fully customized before pointing your domain name to your server. You may want web developer, or a person with technical expertise, for these steps, especially if you wish to customize the site beyond what is available via the content editor. 1. View the City72 code on GitHub. From the City72 GitHub repository you can deploy the application to Heroku or fork the code if you wish to develop additional features. Press the 'Deploy to Heroku' button. Create or login to your Heroku account. The installation will be free, however, you will need to validate your Heroku account with a credit card. Note: If you wish to deploy to your own servers, they will need to support a Ruby on Rails application with a Postgres database. 3. Customize the settings of your app. Follow the detailed instructions on GitHub to set up your mail server, login, and password. Use the Content Editor to customize your City72 site. First, Gather your Content. In the Content Editor, you'll input information such as: site name, text descriptions, imagery, details of your organization, links to affiliates, and an emergency Quick Guide. You will also be able to embed a Google Crisis Map and Twitter Update feeds. 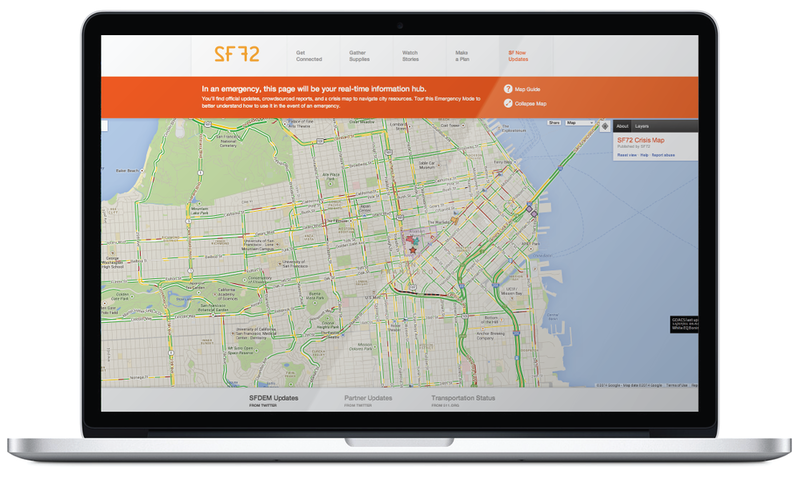 One of the key tools on City72 is the Map & Updates page. It features a Google Crisis Map with information about what's happening in your city, and Twitter updates from trusted public sources and partners. The Google Crisis Map can be used to share what's happening in your city: day-to-day, this might be road races, traffic, or small incidents. In an emergency, it might be: affected areas to avoid, resources, and safe places to go. In the event of an emergency, set this as the homepage of your site. Google Crisis Maps visualize layers of information that you plug into your map. It takes practice to feel comfortable with implementing existing layers and adding your own layers, but the Crisis Maps can be an invaluable tool to share information with residents of your city. The City72 Map & Updates page pulls from selected Twitter feeds. There are 'slots' for three feeds: Official Updates, Partner Updates and Transportation Updates. Official Updates are tweets from your organization's Twitter account. Set this up by creating a Twitter Widget. Share crowdsourced tweets by retweeting citizen updates. Partner Updates and Transportation Updates are tweets from sources you select. To create these feeds, make Twitter Lists, and create Twitter Widgets for each List. The Widgets contain a unique ID number you'll use to customize the feeds on your City72 site.